We within the Department of Housing and Residential Programs are dedicated to creating a safe and engaging living-learning community in the residence halls. We focus on creating a residential environment that fosters student learning and a strong sense of community. We encourage our student residents to reach for their goals in a setting that allows them to become their very best. LIVING: We have moved away from the tiny, concrete-walled rooms of yesterday. Listening to our alumni and potential students, we have moved to suite-style rooms. This increases the overall level of comfort and thus creates a better studying/living space. There are many opportunities to enjoy your time on campus. From the comfort of your room to connecting with other students in the common areas, you can find a “work/life” balance on campus. LEARNING: You came to Millersville to learn and grow as a result. We strive to create an environment that enhances your education. The Housing and Residential Programs staff provides a wide variety of educational and social activity opportunities throughout the academic year that we encourage all of our students to participate in. Additionally, we’ve created Living-Learning Communities within our residence halls in order to group students together who have various academic and social interests and passions. Students are encouraged to feed off of each other’s educational passions, skills and knowledge. Our alumni state that they have learned just as much outside of the classroom as they have in class. AMENITIES: Our residence halls have a wide variety of amenities for your use and enjoyment during your time at Millersville. Internet access is readily available through Ethernet and WiFi options. 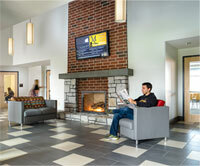 Cable TV with HBO is included in all student rooms. Our campus snack and soda vending machines, as well as our washers and dryers, add a level of convenience for our residents. There is an on-campus health center and a large recreation center with the latest in exercise amenities. The Millersville shuttle bus provides easy access to the entire campus in addition to several nearby shopping centers. Millersville students, faculty and staff may access the MU Xpress, MU Park City Xpress and Route 16 at no charge by showing their student or staff ID cards during the fall and spring academic year. SAFETY: The residence halls are supervised by full-time professional staff members along with graduate assistants and undergraduate resident assistants. Additionally, the Millersville University Police Department provides 24-hour coverage year-round with a full staff of state-commissioned police officers. Peripheral doors are locked, and entrance to all of the halls is by electronic key card access. Individual student suite and bedroom doors are also lockable with individual keys issued to the students living there. There are currently over 40 emergency “Blue Light” phones on and around campus. 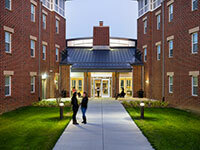 Millersville University has received a Safety Rating of 92.56 out of 100, according to StateUniversity.com. Learn more about campus safety. DIVERSITY & INCLUSION: You’ll meet and create relationships with many faculty, staff and students from different backgrounds and cultures, and have the opportunity to learn from them. We attempt to create an environment that is inclusive for all of our students on campus. NUTRITION: We have the only on-site food preparation facilities among the Pennsylvania State System universities. You can also choose from two different dining halls or several other eatery locations across campus. Student Lodging, Inc. (SLI) wants to help you find affordable and safe student housing conveniently located adjacent to Millersville’s campus. If you have earned at least 30 credits, you can explore SLI’s various housing options at the Brookwood Court Apartments and Healthy Living (Wellness) Apartments. If you or someone you know needs immediate help—dial 911.